The course will be taught at the Friday Harbor High School STEM Center by Brent Huntington. 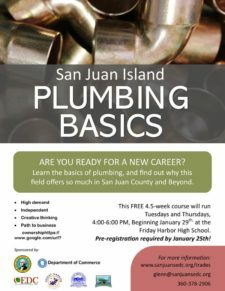 The program is intended to benefit participating students as well as local plumbing companies in need of skilled employees. 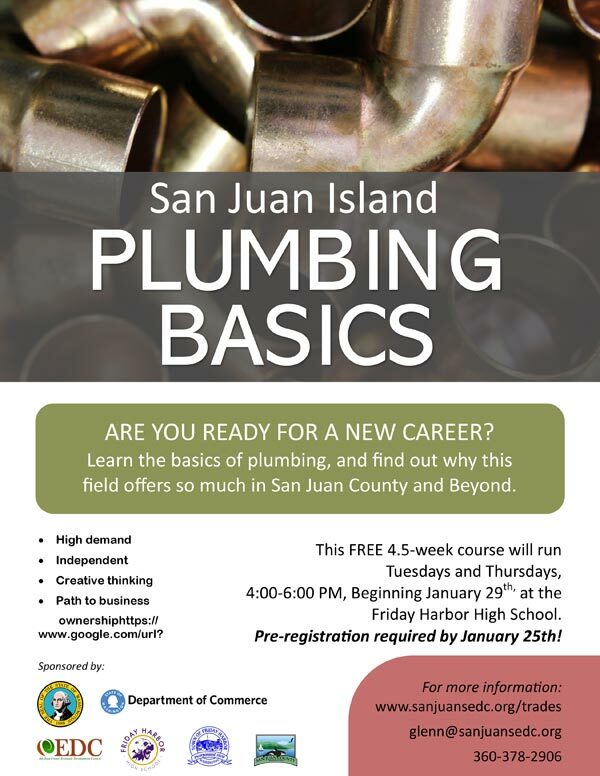 The hands-on curriculum has been designed for students and career changers, and will include a history of plumbing, career information, tool usage, standard plumbing code, safety, and more. This class is free to residents of San Juan County, but space is limited and requires pre-registration as well as a filing fee of $10. The course will run from 4:00-6:00PM Tuesdays and Thursdays from January 29th though February 26th of 2019. There is no cost for the training; pre-registration and a $10 filing fee is required. The deadline to apply is Friday, January 25th.